The New Features guide for 12c reports enhancements to AutoDOP but unfortunately there is not much details so let’s try to dig a little to find out which are (some of) those enhancements. The focus on this blog post is on how the Degree of Parallelism (DoP) is computed for three SQLs in 11.2.0.4 vs 12.1.0.2 (so not considering ADAPTIVE degree policy) reading a single table, joins will come in a separate post. First requirement to play with AutoDOP is to have IO Calibration statistics in place (UPDATE: the requirement is in 11.2.0.x, in 12c default values are used when IO Calibration are missing, 200MB/s is the default for MAX_PMBPS). Since all my tests are on VMs on my personal machine the IO response time is very unstable so for the sake of consistent results I’ll manually set the IO Calibration stats (AFAIK this isn’t recommended, also the INSERT requires an instance restart to take effect). We’ll use 10 as value for PMBPS (Max MBPS during parallel scan). And here are the three tables with 10k, 50k and 16M rows each used in the tests. Each row is created to account for pretty much 1 block (in a 8k block_size database) in the first two tables so those tables will grow large in size even with just a few rows, the third table is designed to be very small. We’ll use three SQLs to check different scenarios and how they show up in the 10053 trace. EXPLAIN PLAN has been used just to force a hard parse each time (it won’t have any “negative” side-effect here). As we already known (nice post here) in 11.2.0.x the DoP under AutoDOP is based on “IO cost” for the operation and the calculation is performed for each table individually at the time the CBO calculates cardinality and best access method for the table (aka you’ll find it under SINGLE TABLE ACCESS PATH section of the 10053). The CBO decides to execute Q1 in serial in both versions, let’s look into the details. From 11.2.0.4 trace, the first 4 lines in green are the input values used to perform the math, the next two are about In-Memory Parallel Execution (nothing to do with In-Memory Option) and the last three lines are the most interesting ones. The following is based on my understanding and tests so it could easily be wrong. The first “AutoDOP: parallel operation is set to NO” refers to the lack of PARALLEL hint in the SQL, if you add the hint then the message becomes YES prefixed by another one with the degree specified in the hint (if any). The second “AutoDOP: parallel operation is set to NO” is based on the fact this SQL is not “expensive enough” to qualify for parallel execution, basically the E-Time is lower than PARALLEL_MIN_TIME_THRESHOLD. The last line shows the details of the math. In 11.2.0.4 the DoP is indeed computed based on how large is the segment (tot_io_size=79MB) and how fast we can read from disk (maxpmbps=10MB/s) so 79 (MB) / 10 (MB/s) = (time=) 7897ms. The value is then divided by 10k (unit=, not sure where the value comes from since it doesn’t seem related to PARALLEL_MIN_TIME_THRESHOLD even though it does represent 10s) and the result (0.7) considered as DoP. DoP 0.7 means this execution will be serial. The value of dop=2 -> maxdop=2 is a little misleading here (maybe it’s a default in the code), PX is rejected here and the SQL goes serial. Compilation completed with Dop: 1.
kkopqSetDopReason: Reason why we chose this DOP is: no expensive parallel operation. kkopqSetDopReason: Reason why we chose this DOP is: parallel threshold. Serial phase is inexpensive (2738), stick to it. Costing completed. DOP chosen: 1. 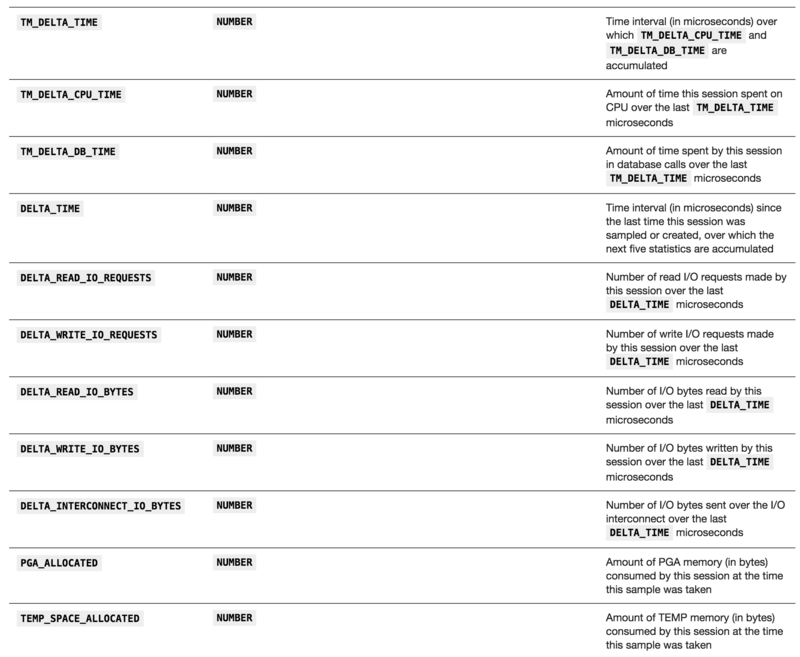 Here we can see the DoP chosen was 1 because no operation was expensive enough to warrant for PX as well as the E-Time for the SQL (7.8s) is below the PARALLEL_MIN_TIME_THRESHOLD (10s). Nothing new so far, let’s look into the 10053 from 12.1.0.2 for the same SQL, Q1 as see how is that different. The first difference is the AutoDOP computation does not happen during the access path decision, that’s why no AutoDOP tag is present in the previous extract. The first big difference is the AutoDOP in 12c also includes the CPU DoP for the operations in the query block, including not only those operations that have an IO cost (i.e. a FTS) but also those operations that have just a CPU cost (i.e. a Join). The way the operations are normalized is via “processing rates”, in 12c there is a new view that provides to the CBO with such numbers, V$OPTIMIZER_PROCESSING_RATE. Values can be manually set using DBMS_STATS.SET_PROCESSING_RATE but they are silently ignored until the hidden parameter _OPTIMIZER_PROC_RATE_SOURCE is not set to MANUAL. Also they can be gathered using DBMS_STATS.GATHER_PROCESSING_RATE. The value for an operation is inherited from its parent in case is missing (the hierarchy is visible in X$OPTIM_CALIB_STATS where each STATID_KKECSTATS has its parent is PSTATID_KKECSTATS). The first line in green (two sections above) provides info about the table we want to scan: size in bytes, number of rows and avg row lenght. The lines in orange is where the CPU DoP is computed, my understanding is here the CPU DoP is the greatest value (expressed in ms) between the “size in bytes / CPU_BYTES_PER_SEC (expressed in MB)” and “number of rows / CPU_ROWS_PER_SEC”, so in this case it’s 10 vs 78.8 = 78.8, which is then divided by 10k (unit=) giving a CPU DoP of 0.0078. The values used for the computation are also reported in the OTHER_XML column. The lines in blue are the same as the 11.2.0.4 one, where the IO DoP is computed (again with the misleading value of 2). The final line in red is where IO DoP (misleading here) and CPU DoP are combined together. As for the 11.2.0.4 case, this SQL doesn’t quality for parallel execution because too fast (the second NO in the blue lines). Serial phase is inexpensive (2737.397801), stick to it. Let’s now focus on Q2, which runs on the larger table T50K. Table this time is around 398MB so 398 / 10 = 39789ms which is larger than 10 seconds (PARALLEL_MIN_TIME_THRESHOLD) hence the SQL is candidate to run using PX, reported in the second “AutoDOP: parallel operation is set to YES” (again this is a guess). The DoP is computed as usual with time/unit that is 3.9 truncated to 3. Signal reparse with DOP 3.
the SQL is then re-parsed and the plan with DoP 3 is found as cheaper than the serial one, hence accepted. Compilation completed with Dop: 3. Costing completed. DOP chosen: 3. Little higher CPU DoP but still extremely low (0.039) and same IO DoP as 11.2.0.4, hence same DoP computed here as well. So the new algorithm lead to the same DoP (which is good, no surprises) because the CPU DoP was too little to make a dent. Let’s now look into Q3 that is where things start to change and get a little more tricky (to make things easier to report I turned off _optimizer_distinct_agg_transform). Signal reparse with DOP 2. Compilation completed with Dop: 2. Costing completed. DOP chosen: 2.
so 11.2.0.4 re-parsed the SQL and decided to go with DoP = 2 because of the IO DoP. the important parts from the extract above are a CPU DoP of 1.6 and an IO DoP of 2 because of the access to table T16M plus a Aggr DoP of 1.6 because of the count(distinct ). I omitted the details of the DoP trying to keep this extremely long post just a little shorter. The three green lines in the previous two sections show the IO DoP and the CPU DoP, the IO DoP is consistently 2 but the CPU DoP starts as 1 and then it becomes 3.
and I think at this point the Aggr DoP (1.6) is added to the CPU DoP from T16M to come up with a CPU DoP of 3. I’ve to admit I’m not sure why this isn’t done at the first iteration, maybe just to save time since a large IO DoP is enough “to get started” with a reparse. This is where the new AutoDOP starts to behave differently and return a different DoP for a SQL (3 instead of 2). I haven’t seen enough real life cases on AutoDOP in 12c to say if it works better than before but for sure it seems more aware of the whole plan and it factors in additional steps (i.e. those CPU only) trying to come up with a more accurate DoP.